I was working on the irrigation today out in the orchard (yes, we have to irrigate sometimes in the winter also) and I ran across this straggler. I bit into it and it was pink inside, which told me it was our Thornberry™ Crab. Thornberry™ Crab is the trade name given by Greenmantle Nursery to the variety Etter 16-32, developed by Albert Etter but never patented. As you can see they are a small apple and the one in the photo was a little bit overdone, but not bad none the less. It had a berry, “fruity” flavor and was decently crisp and juicy. Some will ripen much earlier in the year that are not nearly as good. 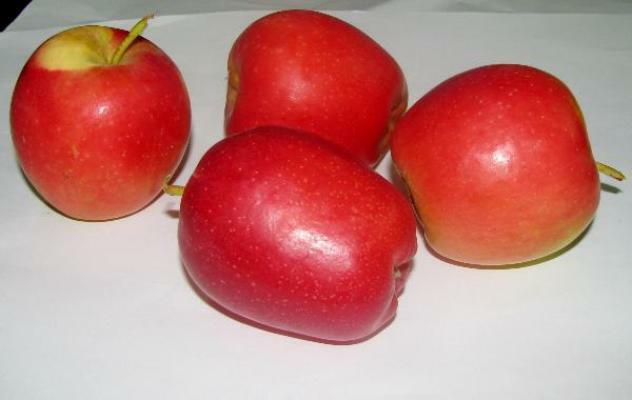 Albert Etter spent some effort developing red-fleshed apples, and this one has a translucent, pinkish hue. I don’t know if I’d grow it just for the unusual pink flesh, as flavor is my top priority. But it’s a decent apple none the less and if you have room for it would be a nice addition to your collection; it would be striking in fruit salads. 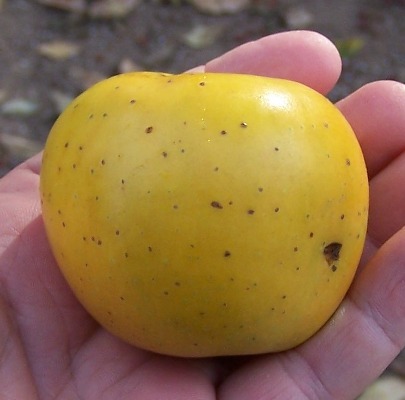 The apple above is a variety called Odem, released this year by Ben-Dor Fruits in Yesud Hama’ala, Israel. Joseph “Seffi” Ben-Dor has one of the only apple breeding operations in the world specifically geared to a warm climate; he cultivates tens of thousands of apple seedlings in his effort to hopefully give the gift of another “Anna apple” to the world. “For unto us a Child is born, unto us a Son is given, and the government will be upon His shoulder. This was fullfilled with the birth of Jesus, sent to the earth by God because “God so loved the world, that He gave His only Begotton Son, that whoever believes in Him should not perish, but have everlasting life” (John 3:16). The Devil Winds have died down to a gentle breeze, and despite frost on the roof last night it has warmed up to a lovely 68 degrees, making for a beautiful Christmas Eve. Today while walking past this Granny Smith tree the apples bumped me on the head, and I detected a fruity aroma, not something I usually associate with Granny Smith. I tried one and wow, very sweet and crisp, a world apart from the ones in the store. 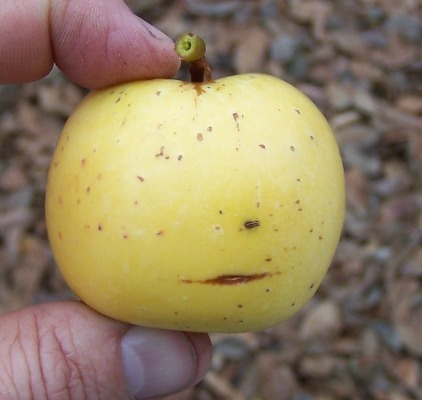 Granny Smith is an insane bearer here, and is one of the first apples I saw growing in Southern California. The first house I rented had a tree out back, and not knowing what they were, I used to hit the drops with the lawnmower. The previous renter told me you could eat them, and polished one up on her skirt for me to try. It was kind of novel to me that you could grow your own fruit (fruit came from a store, not your back yard). Back in October they resembled the ones you see as grass green with white dots, and ranging from tart to flavorless. No one would ever buy the one in the photo, as it looks defective; but oh, the taste they’re missing out on. Another case for growing your own (if your season lasts through New Year’s). 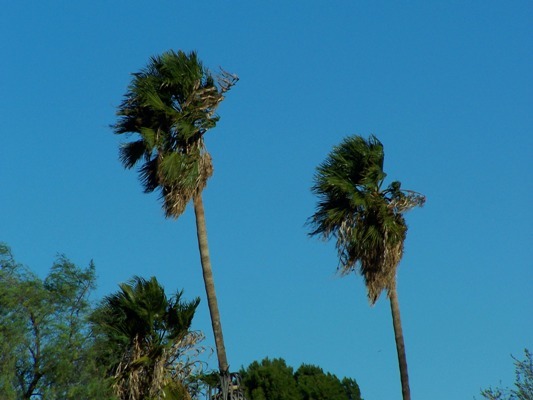 A cold front passed through Monday and high pressure settled into the Great Basin, bringing us the dreaded “Devil Winds” of the Santa Anas. This condition pushes dry desert air through mountain passes and canyons and out to sea, and can be very cold or hot depending on the desert weather at the time. Today is about 58 degrees, cold to us. The winds here are averaging 40 mph, but can gust to 60. Out in exposed portions of Ontario, it can top 90 mph and regularly flips trailers and knocks out power lines. As the air rises to go over the mountains it cools dramatically, making for excellent snow-making weather for the ski resorts; they can dial back the moisture on the snow guns until it is a dry, fluffy powder rivaling the best Utah has to offer. Being a non-skier myself, all we get out of it is static electricity that annoys the fluffy cat and all the potted trees on the front porch knocked over. We had a bit of rain and snow last week and so we’re in OK shap fire-wise; some dry years winds like this can push forest fires with unstoppable fury that consumes everything in its path. But today we just look for skin lotion to make up for the 4% humidity. 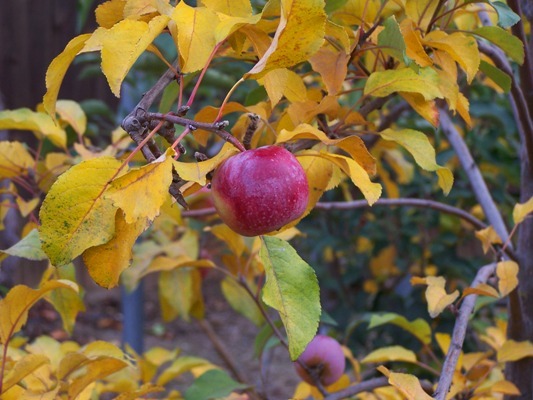 After what seemed like an awfully long wait, Sierra Beauty apples are starting to fall off the tree. I’ve been sampling the since October, with the results being a sour, green starchy flesh that told me it wasn’t even close to ready. But this apple I sampled made my eyes pop with a rich combination of sweet tartness that is a bit extreme on both ends of the scale. Crisp and juicy, it should satisfy those who prefer apples that bite back. 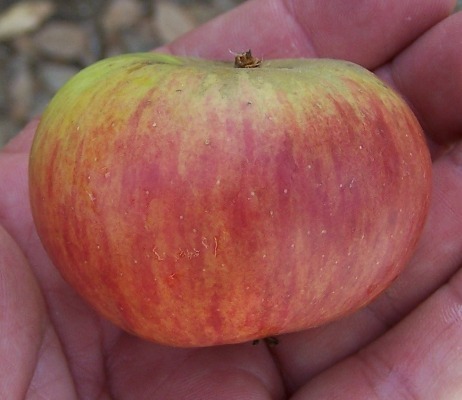 There’s lots to like about this apple, not the least it bears heavily and early in it’s lifetime. The tree has a compact habit, and holds the apples well until ripe. This is a California native of sorts, originating in the mountains above Chico around the turn of the century. I’m glad to add it to our favorites list, as it does quite well in the warm winters and hot summers of Southern California. 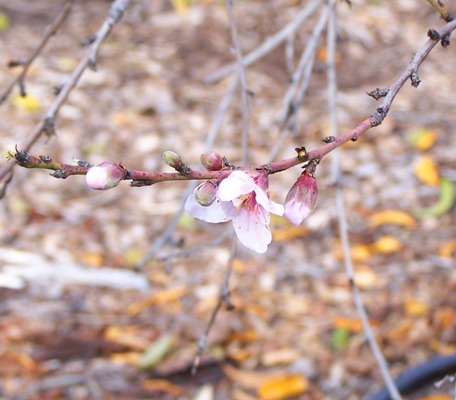 Well, yesterday I was revelling in the signs of all around here, but today I was smacked bythe sight of the Florida Prince peach is starting to blossom. The apples will have a fall and winter blossom here and there but won’t do much of anything, but I’m afraid the peach is the real thing. It will ripen in late April, usually before we’ve had some heat to sweeten it up. Despite lack of chill (we’ve had only about10 hours so far) it explodes in fruit that I struggle to thin in time, as I’m usually messing with apple grafting. 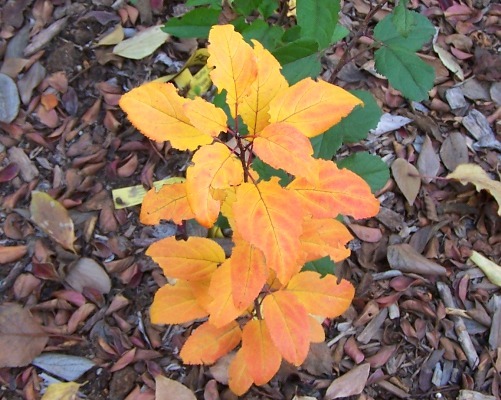 Well, since that last storm its finally starting to look like fall around here, with some leaves turning yellow and the leaves on the seedling rootstocks even giving some honest-to-goodness red and orange fall color (rare here in Southern California). Unfortunately, it doesn’t feel like fall as today was 74 degrees and I was in a T-shirt all day working in the yard. Terry Winter is about ready to pick, and I’ll polish off the rest of the GoldRush, but we still have some stubborn holdouts that need another month or two to ripen up. I’ll be reviewing them as we pick. So enjoy our fall foilage photos below (and no snickering from you folks back East, or I’ll start talking about how nice the weather was today again). Just so I’m not accused of being narrow minded, today’s post will be on a different fruit, in this case Fuyu Persimmon. There’s a lot to like about this tree, not the least of which is this typical fruit load on a 2-year-old tree. 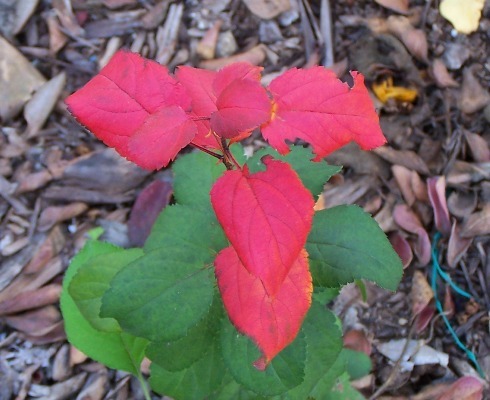 It does this no matter the weather, and isn’t bothered in the least by insects or disease. Soon the leaves will drop off but the colorful fruit will hang on another month or two, slowly ripening to delectable lusciousness. This is a hard persimmon, one that can be eaten in several stages of ripeness. 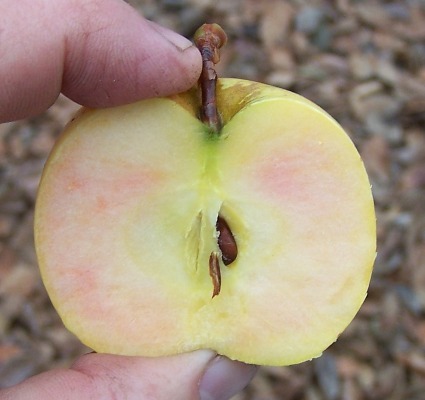 Since there is no pollinator around, it is seedless and once you pull the tough stem off you can consume it completely, right through the core. 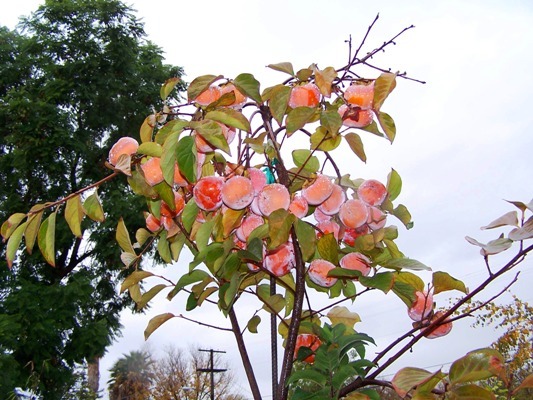 We also have a Hichiya persimmon, the astringent type that must be squishy-soft to be edible. It has the annoying habit of growing 30 feet tall with fruits out of reach that decide to drop with laser accuracy to splat you just as you’re walking underneath; I prefer the hard type. Either way this is a remarkable fruit we are also investigating sending to the tropics. It is also another fruit that adapts well to frigid Eastern winters, just like apples! I know some of you back East are going to snicker, but it rained this weekend, which is a big deal for us. We haven’t really had a good soaking since April, and it’s enough for me to pause and stare out the window at the wonder of it. 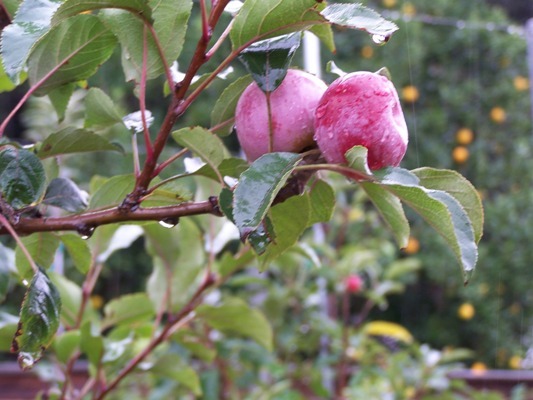 The above photo is some soggy Terry Winter apples superimposed against my neighbor’s Valencia Orange, and streaks of rain in the background. I mean, water just falls out of the sky! You don’t have to pump it or carry it, you can drink it without treating it, and you don’t have to worry about salt content or if it will corrode your pipes. It falls everywhere watering everything, and you don’t even have to run drip tubing or worry how you’re going to irrigate. On the other hand, it really makes a mess here as we’re not accustomed to it. If you drive through certain parts of town tomorrow you’ll see a bunch of blue tarps on roofs that need repairing. We’re also used to leaving stuff out for months with no worries that is now soaked and ruined, and there’s mud and flooding everywhere. We’ll get breathless TV news anchors reporting on STORMWATCH 2009 with ominous graphics, and some reporter will find a car stalled out in a flooded underpass somewhere and do a report on the terrible conditions. After the shoot is done a city worker will wade in and pull the debris off the storm drain grate and the water will disappear again and the car will be towed off. But on the other hand the clouds will clear out next week and we’ll get a glorious view of blue sky and snowcapped mountains as a backdrop to blossoming orange groves. We can go play in the snow, ice, and misery until our heart’s content and then drive home and watch the ice melt off the car in the driveway while we BBQ in our shorts. Winter is not a bad time to be growing apples and oranges here. GoldRush is constantly mentioned as one of the best-tasting and best-keeping apples for the home grower today. 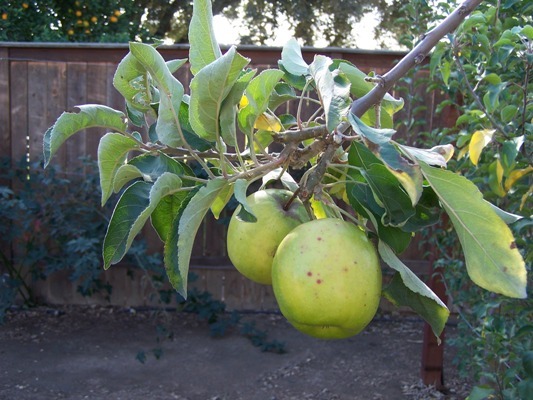 We tried it here in Southern California and it was precocious (bore early in its lifetime) and very productive, the tiny tree producing a nice bundle of apples. In colder climates it is famous for being battery-acid tart until fully ripe, when it becomes delightfully tart-sweet, and the flavor only improves in storage. But our climate seems to rob it of all the tartness, leaving only pleasant sweetness, reminiscent of a good Fuji. Indeed, it was very crisp and juicy, and if I didn’t see the classic “old gold” of the peel, I would think that I was eating Fuji. A product of the Purdue, Rutgers, and University of Illinois breeding program, GoldRush is very resistant to scab and a good choice for those who have disease problems growing Fuji. I’m sad it doesn’t have the same “bite” as in other climates, but it is a worthy apple none the less. Train the tree so that it shades the fruit, as it is prone to sunburn. It ripens in the second week of December in these here parts.